The scene: The main bar – The Old Swan Hotel, Harrogate. The time: Can’t recall, but was definitely late and somewhat blurry (no idea why). I’d been having an enjoyable chat with Martyn Waites following a great day’s crime writing events at last year’s festival when he suddenly broke off from our conversations to grab a passing debut author to introduce her to me. 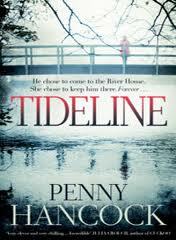 THE debut author to watch out for, he assured me, Martyn championed Penny Hancock and her novel TIDELINE to me there and then, yet another indication of just how supportive crime fiction writers are (even to those with different publishers). Fast forward to the end of last year and, as soon as I spotted TIDELINE appearing on Simon & Schuster’s ‘upcoming releases’ lists, I was keen to get an early request in. And now, having read it for myself, I’m next in line to start singing its praises to all I meet. What do we do, or are we prepared to do, when we have secrets to hide away? What are we prepared to do to keep those we love from ever leaving us? Set in riverside Greenwich, and specifically the River House where voice coach Sonia lives, TIDELINE is a dark and unsettling tale of abduction and entrapment with all the obsessive power of Stephen King’s ‘Misery’ and Thierry Jonquet’s ‘Tarantula‘. From the first pages it is clear that Sonia is a complex and involved character and that, as with the river outside her door, much is lying in secret below the surface with her. Something has happened in her past, something that is revealed oh so slowly throughout the novel in short flashbacks as Sonia’s first person narrative makes mention of a boy, Seb, from her childhood and an event that took him from her near to where she now lives and refuses to leave. When fifteen year old Jez Mahfoud (a nephew of her family friend Helen Whitehorn) visits her home, asking to borrow a rare Tim Buckley album from her husband’s music room, he has no idea of the spider-like trap in which Sonia will ensnare him and keep him in the River House, never wanting him to leave her side again. Jez is in the UK from Paris, staying with his aunt Helen and cousins Barney & Theo whilst he seeks interviews for music colleges. Once he disappears, the finger of suspicion begins to point at Helen when she cannot explain away all of her absences from her own home and the police begin to suspect that she may have wanted to improve her own son’s chances of a college place by removing Jez from the running. Drugged and suspecting that he may be being kept hidden away as part of a complex sixteenth birthday surprise, at first Jez is happy to play along, but then as he becomes sick and weak and is transfered the the garage to avoid the rest of the family discovering him, Sonia’s abduction of him starts to become more and more of a challenge and problem for her. This leads to many a moment of chance discovery and the moments that make novels like this so rewarding as the reader wants to shout into the book to warn the protagonists of clues or when secrets are to rise to the surface. With Sonia’s past being revealed to us in teasing flashbacks as the investigation continues around the area, I found myself desperate to know more all the way through – until the final shell-shock moments, which left me open-jawed. If you loved the psychological thrills of ‘Before I Go to Sleep‘ by SJ Watson or ‘Into the Darkest Corner‘ by Elizabeth Haynes, or the desperate measures to cover crimes of Graham Reece’s ‘Mice‘, then this is for you. We’re just going into the second week of 2012 and already a book of the year has clearly risen to the surface.